25 Animal and food processing wastes: Processing waste materials generated in canneries, slaughterhouses, packing plants or similar industries, including animal manure when intended for disposal and not reuse. Also included are dead animals. 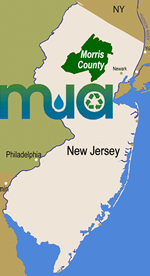 Animal manure, when intended for reuse or composting, is to be managed in accordance with the criteria and standards developed by the Department of Agriculture as set forth at N.J.S.A. 4:9-38. Note this is the defined by state regulations and does not necessarily mean your program accepts all of these materials that make up this definition.